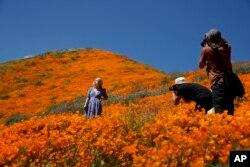 Renee LeGrand, of Foothill Ranch, Calif., takes a picture among wildflowers in bloom, March 18, 2019, in Lake Elsinore, California. A model poses among wildflowers in bloom, March 18, 2019, in Lake Elsinore, California. 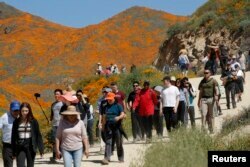 People walk among wildflowers in bloom, March 18, 2019, in Lake Elsinore, California.